Ahhh, October is here and I couldn’t be more excited to get in cozy mode – a.k.a. living in sweaters and sweatpants and drinking all the turmeric tea tonic I can get my hands on. Let’s do this! I used to think of “tonic” as tonic water. But when I realized that it related more to a healing beverage or substance, I’ve been calling this recipe a “tonic” ever since! This turmeric-ginger-lemon variety has been on repeat for some time now, so it was due time I share it with you all. It’s easy to make, requiring just 5 minutes, 3 ingredients, and 1 pot. Healthy and easy? Yeah, now we’re talking. The base for this easy tonic is lemon juice, freshly grated ginger, and freshly grated turmeric. You can elect to add maple syrup, but I didn’t find it necessary! The only other thing I prefer is a little kick in the form of cayenne pepper. So what makes this tonic healing? Good question. 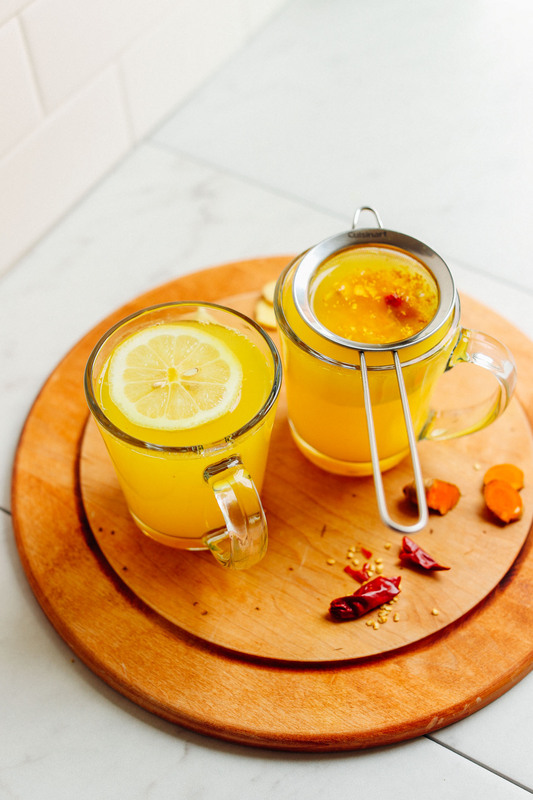 Make this tonic when you’re feeling down or sick, need to destress, need some help in the digestion department, have an upset stomach, or just need something cozy when it’s cold outside. If you’re into healing foods, also be sure to check out my 5-Ingredient Detox Smoothie, 5-Minute Detox Salad, Turmeric Carrot Ginger Smoothie, Super Green Spirulina Smoothie, Ginger Colada Green Smoothie, Go-To Smoothie Bowl, and Golden Goddess Hummus! If you try this recipe, let us know! Leave a comment, rate it, and don’t forget to tag a picture (boomerang or story) #minimalistbaker on Instagram so we can see. Cheers, friends! 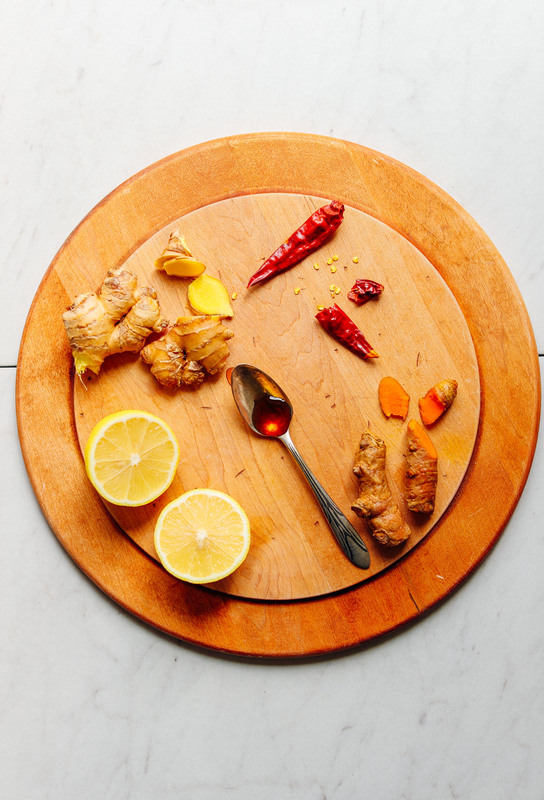 A 5-minute, 3-ingredient, 1-pot healing tea tonic with ginger, lemon, turmeric, and cayenne. The perfect way to detox the body, recover from a cold, or relax before bed. 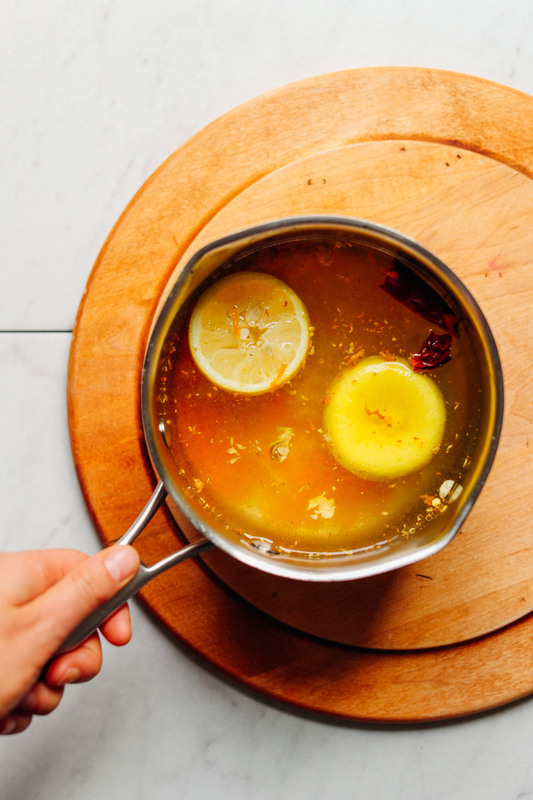 To a small saucepan, add turmeric, ginger, lemon juice and leftover lemon rind, maple syrup (optional), cayenne (optional), and filtered water. I personally didn't think it needed any sweetener, but sweeten to taste. Bring to a simmer (not a boil) over medium to medium-high heat (~3 minutes). Then turn off heat. Set a small strainer over serving glasses and divide between two mugs. Enjoy. If the tonic is too potent for you, dilute with more hot/warm water. Store (strained) leftovers in the refrigerator up to 2-3 days. Reheat on the stovetop until just warm. *Nutrition information is a rough estimate calculated without cayenne or sweetener. *Clear mugs from Crate and Barrel. Small strainer from Amazon. Hi Rosemary, if you omit the cayenne, it will be less spicy. If you find ginger to be spicy, then this may not be the recipe for you. You could try reducing the ginger and see if that meets your needs. Hope that helps! Thank you for sharing this wonderful drink. Just wondering how much can I drink this tonic in a day ? I have slight arthritis in my hands. We love having one of these after a good hard run or a long, hilly bike ride. Perfect way to nourish the body! Tastes great cold or hot!! Got rid of my cramps! As you know ‘man flu’ is deadly but thanks to this recipe I might just pull through. Tastes great now the old taste buds are getting back to normal. Hi I have tried your turmeric wellness shot recipe & love it, you had suggested keeping the pulp for this same recipe. My question is, how do you use it in this recipe? Hi Charise, you could pour boiling water over the pulp to reuse it. Though it won’t be quite as potent as this recipe. Hope that helps! Just made this tonight. I added pepper and coconut oil, plus a bit of orange juice. Delicious!! Thank you for this, it will be a regular for sure. I have to take the time and thank you so much for this recipe. I love all your recipes but this one has changed my life. I drink a bit every day and ever since the first day my sleep has been amazing after not having slept properly in 6 months. I also feel like a renewed human every day. It is truly healing, thank you so much for this and for everything. Making this for my second time (my mommy is sick :( ) and Im left curious: do you peel the tumeric and ginger? Why shouldn’t we let the tonic boil? Hi Aaron! No need to peel since you strain it anyway. Boiling it can reduce some of the health benefits, which is why we don’t recommend it. Hope this helps! I’m new to this but been told to max out on turmeric and thought we would try. I have made twice now and each time added fresh ground black pepper and cayenne and a small drizzle of coconut oil. First time i made with dry powder turmeric but fresh ginger and we think its great and want this every day.. Second time made with fresh turmeric and fresh ginger and added a small stick of cinnamon and wow well done for a great recipe. Made this today with lemon, black pepper, tumeric, ginger, and organic honey. I used dried organic tumeric and dried organic ginger because that’s what I had on hand. Your recipe says fresh is better. Why is fresh better? Great blog. Always a wonderful plant based recipe to try! We’re glad you enjoyed it, Charlotte! Fresh is always better as you’ll get the most flavor and nutrients, but dried will work in a pinch! I love this recipe! I use the cayenne pepper instead of the black pepper as black pepper is a stomach irritant and has also been linked to cancer. The cayenne pepper makes the turmeric bioavailable just like the black pepper except without the harmful side effects. Wonderful recipe for cold winter days! 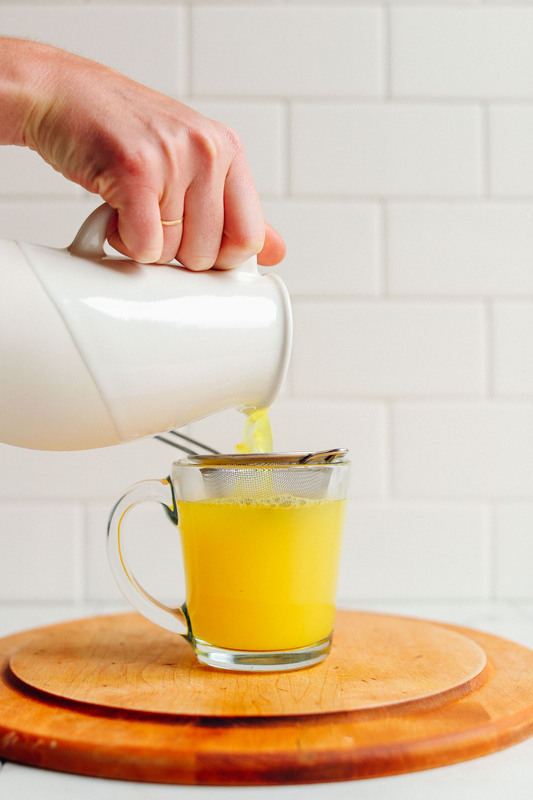 Add some Apple cider vinegar and drink it cold on hot summer days to transform it into a delicious turmeric switchel! I dreamt about buying fresh turmeric root as well as fresh ginger root last night… my body telling me something? 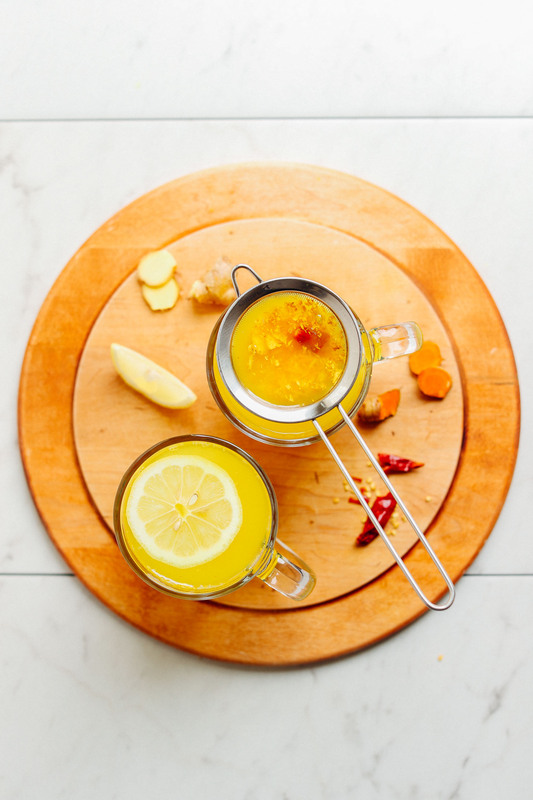 So I looked up “healing tonic with turmeric and ginger@… I’m excited to try this recipe this afternoon! Love the feedback and comments re: black pepper and coconut oil! Curious, I’ve been told that when using lemon juice in teas and tonics, it’s importantvto add it last as heating/cooking it removes a lot of the health benefits… any one else aware of this? This drink is amazing! Had a really bad cold and very congested. I made this using tumeric powder along with all the other ingredients mentioned. It looked and tasted absolutely delicious and within half an hour I started feeling so much better. I’m so glad I found this recipe, thank you for posting. I’ve finally found something that works wonders and I will be making sure I’ve always got the ingredients to make it as often as I want or need it. Thank you! Turmeric is actually ONLY bioavailable when consumed with black pepper, it doesn’t just merely help. It’s ineffective and benefits are not available if consumed without black pepper. Lovely recipe!!! I made a big batch of this. Do you think I could freeze some in mason jars? We haven’t tried and can’t say for sure, but I’d recommend ensuring you use freezer-safe jars! 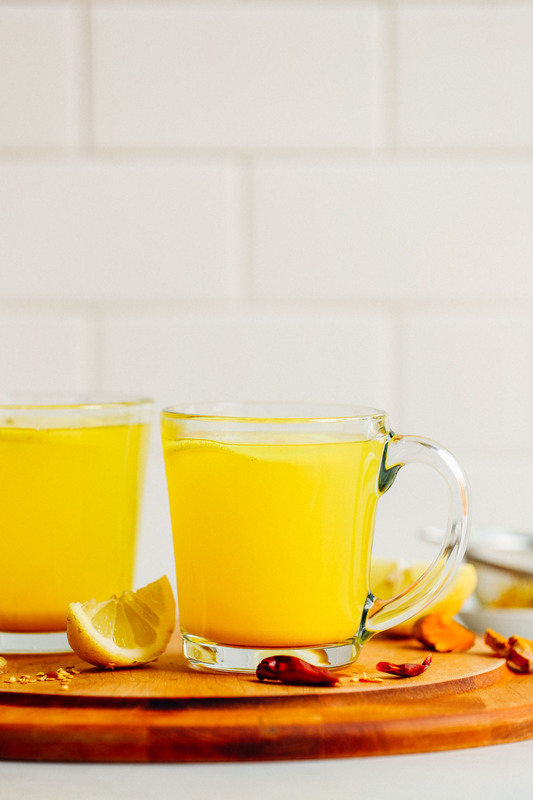 I have been looking for an easy turmeric tea/tonic for inflammation. Almost all of the posts never mention if this recipe works well for that. I have sciatic pain and I am hoping to find something that works almost immediately to help relieve pain rather than taking oral prescriptions that have side effects. Do you know if I would have any immediate pain relief? Thank you. Pam, we can’t offer any advice or promises on what this tonic can offer in the way of pain relief. We recommend you talk with your doctor about that! Thank you for the fresh recipe and beautiful photos. As some of the other readers commented, I have also been making a similar morning detox drink with the same ingredients as well as ACV. However, from my health research, to get the full benefits from lemon juice, it needs to be raw (kept below 120°F). If I were to simmer and steep the turmeric, ginger and lemon peels in water, and add the lemon juice at the end after I have strained it and it has had a chance to cool, how much water should I use? Have you considered keeping the lemon juice raw to maxima the benefits? Thank you for a wonderful recipe!! I’m enjoying it now. It’s a great way to end the day but I might also have it in the mornings. Do you use the leftover pulp for anything? Could I throw it in my smoothie in the am or something else? We’re glad you enjoy it, LeeAnn! The pulp is great for compost if you have a garden, but if you try using it in a smoothie, report back! Good luck! Oh wow! So delicious! After reading all the great comments, I wanted to make it asap! Had all the ingredients: Squeeze Ginger I had in the frig- somewhat between fresh ginger and ginger powder), Turmeric Powder (my nearby store didn’t have turmeric root, so I’ll stop by W.F.’s next time for the real stuff), fresh lemon, etc. I LOVE LOVE LOVE this tonic; however, I’m now calling it The Magical Elixir Tonic! First time on your website – Can hardly wait to try all more wonderful and healthful recipes! Fabulous! Question – will turmeric stain teeth? Hi Ann! We’re so glad you are a fan! While turmeric tends to stick with whatever it gets on, it shouldn’t stain your teeth as long as you brush regularly! UMMM. I’m speechless. This is amazing! I absolutely love the flavor and the way it made my stomach feel. It helped clear digestion and smoothed my stomach within minutes. Definitely keeping this in my list of “go to’s”! Thanks!! Glad you enjoyed it, Hilary! I had a fever and headache so I decided to try this recipe as I came across it the night before. Not only does it taste good but IT HEALS. After drinking the tea and going to bed I sweated profusely, which I thought was a good thing. The next morning I had no fever and th3hwadache had subsided. Thanks for sharing. This was delicious and just the sort of thing I was looking for! I only had a pinch of turmeric powder on hand but it was really yummy and beautiful color. I will be making this again and again! Thank you! i made it exactly as says and fresh ingredients but the color is not like that. Did i do something wrong? No! Turmeric comes in different colors, sometimes it’s bright orange, other times it’s paler in color. If it tastes good, you’ve done everything right! Can this drink be made with both ground ginger and ground turmeric and lemon juice instead of the fresh. Yes! Recommendations are listed in the ingredient list. I love this recipe! I have made it a few times and it is super easy and delicious. I’m really impressed with how nice this drink made my stomach feel! I have recently tried drinking apple cider vinegar drinks in the morning and was unimpressed. I love the flavor of this drink and it’s calming effect! I will start drinking this more often. I am new to using fresh ginger and turmeric, how can you store it and how long does it stay good for? This was delicious – my boyfriend and I made this to try to fend off a cold and we both love it! Perfectly spicy and so healthy! Definitely going to become part of our routine. Warning if you use fresh turmeric – definitely stains your hands! Is this safe for women who are pregnant? I’m not sure! Please consult your doctor on that. 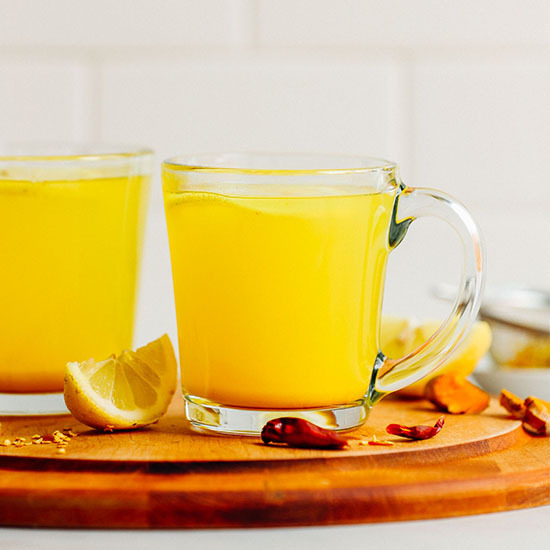 We have been drinking shots made from juicing fresh turmeric, ginger and lemon and adding black pepper every day for a few years in addition to a green smoothie. Both are cold. Recently, my husband mentioned that these cold drinks made him uncomfortable, so I heated up his smoothie. I’m going to make this recipe for him instead of the cold shot from now on. So happy to see this post today! I made this last week and it was awesome. I still have some in the fridge (5 days later), and it still looks good. I’ve had a small cup here and there. I love it! I added just a pinch of cinnamon to this recipe and it is divine! Thank you for sharing!! this is perfect, no sweetener needed ?? will be making often for sure. I’m for some reason surprised by how good this tasted! I didn’t have anything fresh though; I did it with powders and lemon juice from a bottle and it was still great! I’m suffering a cold right now so I made this tonight. It was quite tart even after I added a bit of honey to my cup. I think next time I’ll use only half a lemon. I added a bit of black pepper to the batch and a touch of coconut oil to my cup and put the rest in the fridge for tomorrow. I hope it makes me feel better! I have all of the ingredients for this in the house! I’ve been meaning to make some kind of tonic with turmeric, I thought about grating it and putting it a small jar of honey. I just got a bottle of raw honey from a local farm just 1/2 mile away here in Kauai & a friend farmer came over for dinner the other night with a whole bunch of turmeric root. But, this looks better than turmeric honey. I could always add the honey as a sweetener or to soothe my throat. I will report back. Thank you! Try sorrels tea as a replacement for lemon or citrus juice. Sorrel is loaded with vitamin c and it’s great with ginger, turmeric, black or cayenne pepper, . Great for anxiety and depression. Lowers cholesterol, blood pressure and glucose. The creator knew what he was doing and what’s best for the body. He designed It. My doctor is all into natural healing and does mind telling me. Please try juicing the lemon, turmeric and ginger you’ll get the full benefit . Sounds similar to a lemonade recipe I made recently. Instead of water I used steeped butterfly pea flower tea. It is a beautiful blue color. When lemon Is added the color changes to a purple-pink. Making is yummy and pretty! Try it! So, so spicy, but I upped the chile ratio to combat an upper respiratory infection. This. HIT. THE. SPOT. Seriously delicious–spicy, sweet, tangy, and best of all–medicinal properties on point. This one will be a staple this season! This was so yummy and made me feel great! I will continue to make this all fall / winter long :) Next time I’ll make sure to wear gloves though, my fingers are yellow right now – oops! Just wondering if there is anything I could use instead of lemons or citrus fruit in general? I am allergic to citrus fruit and almost all those healing recipes include them. What can I do? I work in the university and find myself coming down with colds and flues all the time! I made this tonight and I really like it! I typically drink hot lemon water before bed so this is a great addition to my nightime routine. Thank you for sharing the recipe! Love this! I’ve made this two nights in a row and it’s the perfect tonic to sip and relax before bedtime. The boyfriend was feeling sick so I took the opportunity to whip this up and he liked it! He thinks it helped him feel better. I added some fresh ground pepper to it. I love the heat the cayenne pepper gives it. Thanks for another winning recipe! Perfect drink to have when you are all congested from a cold! I’ve been drinking this exact tonic for years! I even wrote about it a few years back because it was a life-changer for me! I like a lot of cayenne in mind because the kick wakes me up. After I started, my caffeine cravings went away completely. Does it need to be cooked? Can we use it fresh? Cooking it intensifies the flavors. But no! You could probably do without cooking. Made it today and loved it. Upon reading the other comments about the black pepper and oil, I will add that to my next cup. Thanks Dana! This looks so good, and perfect for knocking out those change-of-season colds! Sadly I’m allergic to all citrus fruits (including lemon)- do you have any suggestions for what to substitute instead? Hmm, you could just leave it out and rely heavier on the ginger and turmeric! Perhaps you could try replacing the lemon with apple cider vinegar vinegar? I’ve used that in hot toddys or to replace the lemon, honey, cayenne hot water drinks in the morning, when out of lemons. I made this yesterday, but it wasn’t to my liking. It was bitter and too spicy for me. After adding a lot of sweetener I could drink it.. but I think that likely negated most of the health benefits ¯\_(ツ)_/¯ maybe if I make it again, I will try diluting it. Thanks for the feedback! If you don’t like tart / gingery drinks this may not be for you! Lovely recipe! I would probably add a teensy-weensy pinch of black pepper to help activate the antioxidants in turmeric that fight against cancer! Sounds weird, I know, but it works like a charm! I think you only need 1/20th of a teaspoon per 1/2-1 teaspoon of turmeric! Thanks for sharing! I do love my cayenne, but may consider adding both! I just wanted to say congrats on your awesome website, beautiful photos, and inspirational words! You guys are really awesome, and I love receiving your new recipes! I add black pepper to it. Can you use liquid turmeric? I’ve never heard of that. But I suppose so! Let me start off by saying, whoa! I made a double batch, read the comments about adding black pepper and coconut oil and as soon as I took one sip my eyes lit up. I hope it helps me sleep and soothes some of these pains I’m having, but the taste alone is superb! Thank you, ladies. I have seen Fresh Ginger in the grocery stores but I don’t recall ever seeing fresh Tumeric. Is that hard to find or have I just been overlooking it? Natural Foods has fresh turmeric. I am looking forward to trying this. It looks pretty too. I pinned it. I really want to try this. Would it be safe while breastfeeding? Wasn’t sure how prominent the detoxing is. I wasn’t feeling well when I woke up, but I have a full day of phone meetings I could not miss. This recipe came to my email just in time! I didn’t have a lemon, so I made it with an orange instead. I added the cayenne and am LOVING it! Thank you for a timely, tasty recipe. Does using fresh turmeric stain less than using powdered turmeric? I just made this almost instantly after I seen the post. I have not had seasonal allergies before so this has been a little rough for me. I love coffee and warm lemon water, but in the middle of the afternoon I am searching for something else. THIS IS IT!!! It’s warm, fragrant, and I personally added a stevia packet to mine to sweeten it up. PERFECT for calming these sinuses and satisfying on a rainy day like it is here! Thank you! Thanks for sharing, Myranda! Glad you enjoyed it. Girl! You read my mind! Can’t wait to enjoy this lovely warm hug during some cold Canadian winter nights. Hi there! Can you make one batch of this for the week or do you recommend making daily/nightly? Looking forward to trying this Fall/Winter! I make mine daily as it’s best when fresh! Is it possible to throw in a few small pieces of turmeric instead of grating? Would that have the same effect? Yes, but the flavor and color won’t be as prominent. What if I cannot find fresh tumeric? Can I use ground, and if yes, how much? Do you peel the turmeric and ginger before grating it? No need since you strain it anyway. I just made this with garlic and added to chai tea to mask that awful garlic taste. The pressure in my ears and my foggy head have cleared up. Thank you SO much!! Now back to work. I was scrolling through Instagram, and as soon as I saw the pic I thought “I need to try this”. The result is even better than I expected it to be. Refreshing, delicious, healthy! Thank you very much for the lovely recipe! I boil my lemons skin and all and add turmeric, ginger, cayenne pepper, honey and apple cider vinegar in a pot then I put into blender and have a glass morning and night topped up with water. Quarter mixture 3/4 water and ice. Decreases appetite while it fills me up and I simply dont have any desire to have snacks during the day. Love it. Debbie would you mind sharing your recipe. How much of each? This looks gorgeous. I’ve always been told that for turmeric to really work, it must be ingested with fat and black pepper (hence golden milk lattes). Is this just hogwash? Or do you recommend taking this tonic with a meal? If drinking your tea warm just add a tea spoon of coconut oil to your cup of tea. Keep it stirred as you drink. I have not tried this recipe but I have drank other teas with coconut oil in them and it is good. As I was scrolling through the comments, I was wondering if coconut oil would work for this recipe! (Cause I want my turmeric to be fully absorbed) And then I see your comment pop up! lol perfect timing. I was curious to know if you find that you feel nauseous at all with adding in the coconut oil? I’ve heard mixed reviews on adding it to beverages, so I just thought I’d ask. :) hopefully you read this!! Thanks. Weetabix warm milk some sweetness and then melt a spoonful of coconut oil, you’re welcome!!! Srsly tho it’s gorgeous!! I was wondering the same thing. I know the turmeric tablets and powder I have include black pepper. This looks amazing and all the things my body needs…but also curious if black pepper is needed. Same thought. I was wondering if the cayenne could substitute for black pepper, and after looking, I don’t think so. If you want your body to better absorb the inflammatory fighting benefits of tumeric, add some black pepper. Otherwise, this tonic looks scrumptious! Hi ladies! If you’d like, feel free to add a little coconut oil and black pepper! I kept mine simple and just enjoyed the soothing flavor and warmth of the drink. But I think those would be lovely additions! this is true! i am married to an Indian-Pakistani and their culture has been using tumeric for many, many years now. we typically use black pepper and some sort of fat (i use coconut oil or milk since i am vegetarian) in order to get the best result for using tumeric. I would like to try this tonight. Would you know how much pepper and coconut oil should be used for the recipe? Every source I’ve ever seen says that for best absorption turmeric needs to be consumed with black pepper….and that the addition of fat is helpful. My husband makes a similar concentrated juice from apple cider vinegar, lemon juice, cinnamon, turmeric and cayenne. He dilutes about 2 Tbsp on a glass of water and drinks it each morning. I am going to see if he would consider switching to yours. It looks a little less harsh and better flavors. Thanks for sharing! I love the beautiful color and can’t wait to try this!